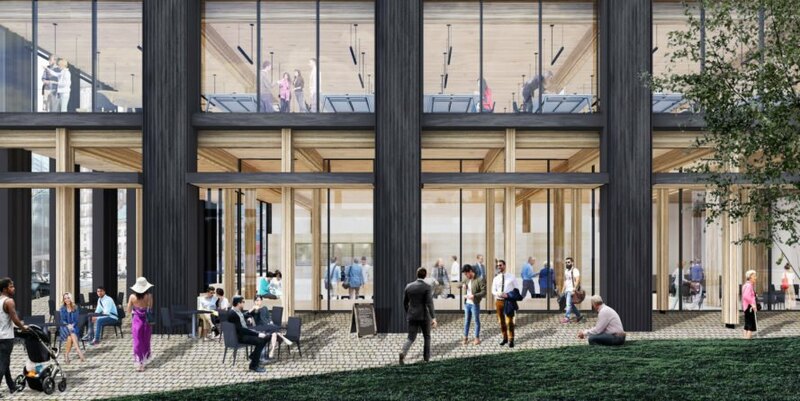 A 500,000-square-foot office building is set to rise in Newark, NJ — and once complete, it will be the largest mass timber office structure in the U.S. Designed by Vancouver firm Michael Green Architecture (MGA), the project is part of Riverfront Square, an 11.8-acre mixed-use development headed by New York-based Lotus Equity Group. 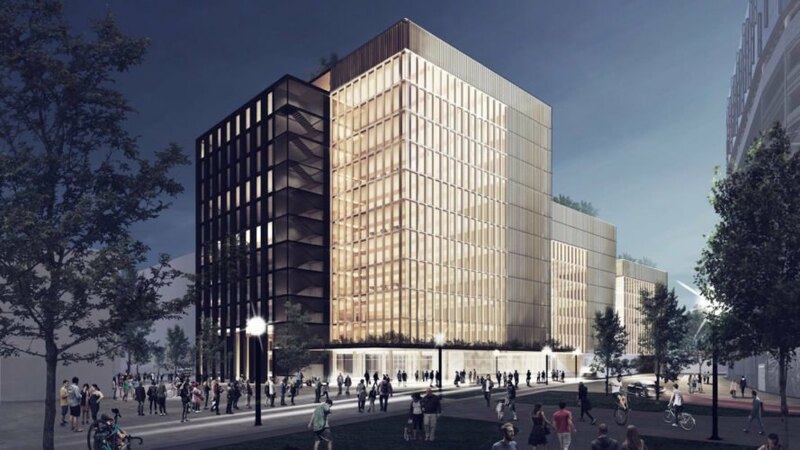 The proposed Newark office will consist of three interconnected volumes and it will be more than double the size of the nation’s current largest mass-timber building, the T3 North Loop M building in Minneapolis. Mass-timber construction is growing in popularity across the U.S. and is lauded for fast construction, strength, and eco-friendly benefits. “The vision we share with Michael Green is to design the most environmentally sustainable office tower that enhances the health of tenants and the surrounding communities through efficient planning and green design,” Ben Korman, founder of Lotus Equity Group, said in a press release. Though the building will be built on a concrete foundation, the structural components will be mass timber and will be treated to be fire resistant. The building comprises three stepped volumes ascending from six to eight and then 11 stories. The exterior will be clad in either brick or metal panels, while the interiors will feature exposed wood and be bathed in natural light thanks to ample glazing and a central atrium. Workers will also enjoy access to rooftop gardens. 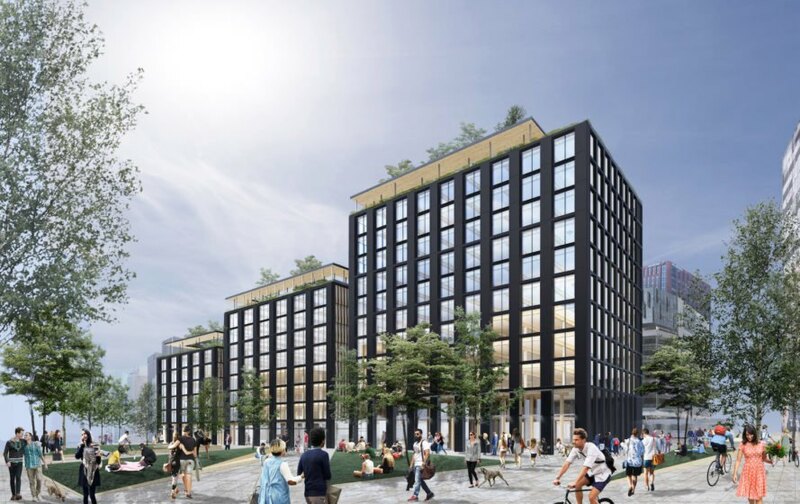 A 500,000-square-foot office building is set to rise in Newark, NJ—and once complete will be the largest mass timber office structure in the U.S. Designed by Vancouver firm Michael Green Architecture (MGA), the project is part of Riverfront Square, an 11.8-acre mixed-use development headed by New York-based Lotus Equity Group. 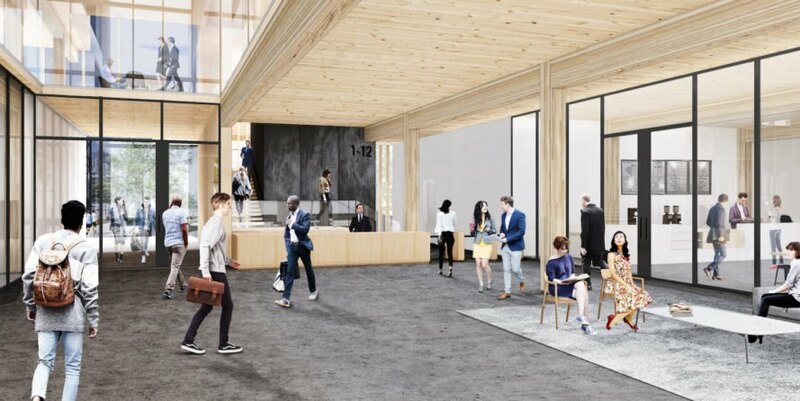 The proposed Newark office will consist of three interconnected volumes and will be more than double the size of the nation’s currently largest mass-timber building, the T3 North Loop M building in Minneapolis that was also designed by MGA. Mass-timber construction is growing in popularity across the U.S. and is lauded for fast construction, strength, and eco-friendly benefits. Though the building will be built on a concrete foundation, the structural components will be mass timber and will be treated to be fire resistant. The building comprises three stepped volumes ascending from six to eight and then 11 stories. The exterior will be clad in either brick or metal panels, while the interiors will feature exposed wood and be bathed in natural light thanks to ample glazing and a central atrium. Workers will also enjoy access to rooftop gardens.